It is possible to raise and lower the TTL (Time To Live) value for your domains hosted at (mt) Media Temple. TTL is the value that determines how long your current DNS settings are cached with Internet Service Providers. What that means for you: In practice, if your Internet Service Provider has the current IP address for your website cached for 24 hours, it won't bother checking for a DNS update for your domain until that 24 hours has passed even if you made a DNS change for that domain 5 minutes ago. On the other hand, someone in another city may be using an Internet Service Provider that hasn't made a query for your domain's DNS settings recently. That person will get the new DNS information right away (and thus be shown your new website right away) because the Internet Service Provider did not cache the information previously. If your site is going to look exactly the same from one server to another, this is probably not a big deal for you. But if you're "launching" a new site, or if you have a live email address at your domain, you may want to first lower your TTL before making any other DNS changes. This can help you avoid a lengthy period where web traffic and email are going to two servers at once. TTL is given in seconds. (mt) Media Temple default TTL is 12 hours, but many other providers will use 24 or 48 hours. Select the domain you wish to modify from the Domains menu in your Account Center. 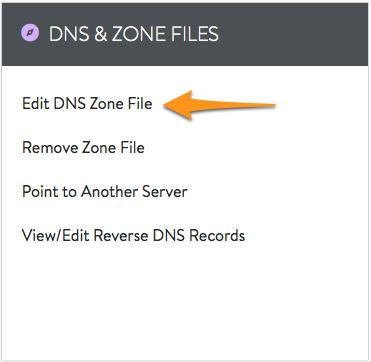 Select Edit DNS Zone File from the DNS & Zone Files menu. Scroll down to the Additional Zone Actions tool, click on the Lower TTL button. Be sure to wait the full length of time the original TTL. To learn more about DNS, please see: DNS Explained. Select the domain you wish to modify from the Domains menu in the Account Center. In the right-hand corner, under Options, click on the Raise TTL value button. See Figure 6. This will raise the TTL value of your domain to the to the defalut TTL of 43200 seconds (12 hours). If you need the TTL set higher than 12 hours (43200), please open a support request in the AccountCenter and (mt) Media Temple technicians can set the value higher. This is necessary in some countries.